We have mentioned the Bristol Channel, which is a very large west-facing funnel-shaped bay with some fairly fast currents. 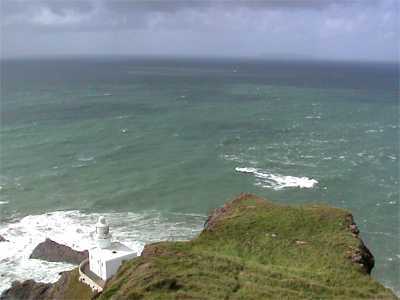 There is a nice little island, Lundy, in the mouth of the funnel, which at that point is 45 miles across. Lundy is closer to Devon in the south than it is to Wales in the north. It is a little over 2 miles long and has a flat top surrounded by high cliffs. At 460 feet high, it can usually be seen from a mainland cliff-top and even from mainland beaches in clear weather. It has few permanent residents but enough visiting rock climbers and naturalists to have a campground, a pub called the Marisco Tavern and at one time a micro-brewery producing a beer called Puffin's Purge. The boat landing is on the south-eastern corner where there is a ledge shallow enough for boats to anchor, a way up the cliff on foot, and a lighthouse. How do we get there by sea kayak? For this exercise, we're assuming that the group has a reasonable mix of abilities and interests so we're not doing a flat-out dash for the island. We're going to take our time over it*. The main current flows eastwards up the Bristol Channel for six hours (until four hours before high water at Dover, as it happens), and then flows the other way for six hours until low tide. On the day of our trip the tidal streams between Lundy and Devon will flow at a maximum of 3 knots. 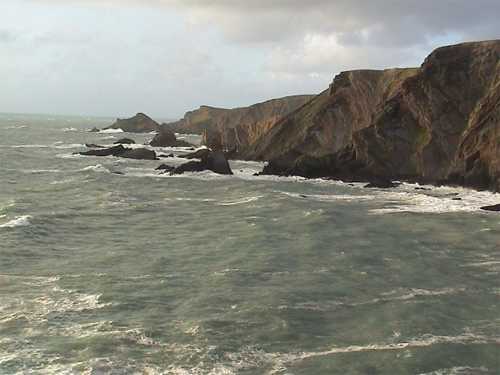 The two launch points closest to Lundy are Hartland Quay, 13 nautical miles south-south-east, and the surf beach at Woolacombe, 20 nautical miles east. Those straight-line distances suggest that a kayaker on a mission could make the trip in 3.25 hours from Hartland Quay or 5 hours from Woolacombe. However this makes no allowance for the tides. 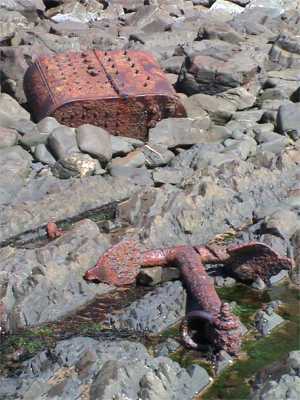 The Hartland coastline is lovely, full of wildlife and easy kayaking on a nice day, but when there is wind or swell it is hazardous, sharp and unforgiving, a jagged line of twisted strata, rocky fangs and shipwrecks. This coast is directly exposed to North Atlantic weather. 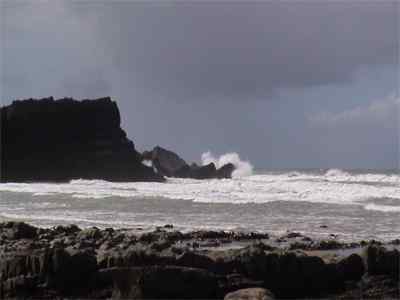 In a Force 5 onshore wind the only possible landing is a narrow passage between rocks to the beach at Hartland Quay, and then only at certain states of the tide. It is a place to worry even the experts. If we go from Hartland Quay during the ebb, we will start our trip by kayaking directly into a 1.5 knot current for two miles until we get to the lighthouse at Hartland Point. This is not a real problem. By staying close to the cliffs we can avoid the worst of the current and even find eddy currents which carry us north. If we arrive at Hartland Point while the tide is still ebbing we will find a minor tide race rushing towards us, revealed by waves breaking in deep water near the lighthouse. The picture on the right was taken with the tide on the flood and the tide race occupying a more northerly position on the right side of the picture. You can just about see Lundy on the horizon above it. We can either squeeze past the tide race next to the cliff, or go a few hundred yards out to sea and bypass it that way. If you have time, at some stages of the tide it can be fun to surf on the standing waves. We have a long way to go, so let's time our open water crossing to start a few hours before slack water and finish a few hours afterwards. Even so, the effect of tides carrying us westwards for the first half of the crossing, and then east for the last part, will increase our total journey time. If we set off from Hartland Quay three hours before slack water and proceed on a constant north-north-west heading, our actual course over the ground would not be a straight 13-mile line but a huge S-shape of well over 20 miles. In fact, we would change course every hour so as to stay close to the direct line from Hartland Point to Lundy, but even so the journey time from Hartland Quay to Lundy would not be 3.25 hours but more like 5 hours*. Woolacombe is further away from Lundy in a straight line, but on a day when the tides are just right, we can hitch a ride on the outgoing tide and head almost directly towards Lundy while travelling at up to 7 knots over the ground. This will cut our journey time from 5 hours to 3.5. Also, the shallow sandy beach at Woolacombe provides a safe landing in nearly all weather conditions. Although it is a classic surf beach so it gets big waves when there's a big swell running. It's another 7 nautical miles to the nearest real harbor at Ilfracombe. *NOTE: An English paddler very helpfully comments that he has paddled out to Lundy five times (which is three times more than your editor) and finds that his paddling pace gets him from Hartland to Lundy in 3.5 hours. He prefers to have slack water at the end of his trip, not in the middle, so that he doesn't meet any rough stuff just south of Lundy when energy is running low. He's talking about the tide race south and east of Rat Island, only a short distance from the beach at the south end of Lundy where you're going to land. A wind blowing from directly ahead will slow you down. If it blows from the side it will push you sideways. This is called leeway and it is hard to calculate the rate of drift. If you are stationary then a wind of Force 3 on the Beaufort Scale blowing from one side may push you sideways at 1.5 knots. In a Force 5 your sideways drift may be 2 knots. See Leeway for a discussion. If you can see your destination you can use ranges to ensure that you go straight there. If poor visibility means that you can't see your destination but you can still see your departure point, you can use your compass to check whether you are still on course. Sea kayakers very, very seldom make open-water crossings without being able to see their destination. However, let's say you want to make a long crossing to an island to the east of you. One thing after another has gone wrong and you now have no choice but to make the crossing in visibility so bad that most of the way you will be able to see neither your departure point nor your destination. The only real way to calculate the speed of your sideways drift would be with a GPS satellite navigation device, but you don't have one. You are asking yourself how the heck you managed to get into such a dangerous situation. You are steering by compass on a course which you earlier calculated as 75 degrees magnetic. There is no significant tidal current. You did not adjust for wind. You are taking it easy and going at 2.6 knots. The wind is Force 3 from the side, and as a result your real course is something like 20 degrees downwind of the direction in which your kayak is pointing (red line). You are going to miss the island by such a large margin that you will go past it without hearing or seeing it. If you really have no choice but to make this crossing, you could greatly improve your chances of finding the island by adjusting your course for wind. In the same way that you can draw tidal triangles, you can draw a wind triangle to calculate the direction in which to point your kayak. You know your course if there were no wind, and you know your own speed. You know the direction the wind was blowing. The only other figure you need is an estimate of the speed of your sideways drift. That is very hard to assess and depends on your kayak, your paddle, the load you're carrying, whether you have your skeg down, the sea state, and so on. In this example we'll say that your heading should be 55 degrees. The wind triangle will also tell you after how many hours/minutes you should start listening and looking for any sign of the island. If you make an open water crossing, wind and currents may push you off course. In poor visibility or where your target is on a coast which lacks clear landmarks, you may reach the coast unsure whether you are to the left or the right of your final destination. Consider deliberately aiming to the left or the right, so that you know which way to turn when you reach the coast.